The obverse of the coin depicts a diademed head of the queen, a design that was already being used for the Jamaica halfpenny. 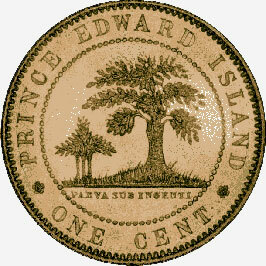 The reverse was adapted from thc official seal for the island. The central design shows a large oak tree (representing the United Kingdom) sheltering three smaller ones (the three countries of the island) with the Latin phrase PARVA SUB INGENTI ('The small beneath the great') below. Because of heavy pressure of work on other coinage, the Royal Mint was forced to contract with the Heaton Mint in Birmingham (a private firm) to produce the Prince Edward Island cents. The specimen illustrated is part of the Bank of Canada's Currency Collection.